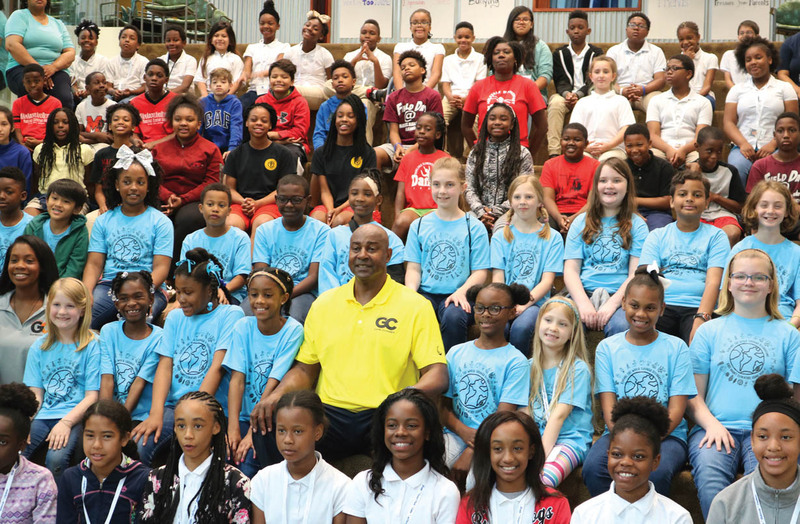 Sidney Moncrief, clad in a yellow shirt, stands with members of the Little Rock Gibbs Elementary School leader group, participants in his entrepreneur leadership learning session. Between 1975 and 1979, he was the charismatic hero of every Arkansas adolescent with designs on basketball stardom. No part of the sport escaped the mastery of Sidney Moncrief, whose play at the University of Arkansas was not merely spectacular but inspiring as well. Nor have 11 seasons in the National Basketball Association (NBA) or almost three decades of retirement proven him anything but one of the most extraordinary sports figures “The Natural State” has ever produced. His single mother was key initially in developing his personality and prowess. A motel maid residing with seven children, she insisted on acceptable school work, chores at home and discipline. Constructively guided and focused, in the ninth grade, Sidney began to display the court skills that were to mushroom into All-American excellence as a high school senior and an intercollegiate performer. Welcoming Oliver Elders’ protégé to Fayetteville in the fall of 1975 was Coach Eddie Sutton, whose fresh approach to a flagging Razorback basketball program, Sidney thought promising. He proved a good prophet. With fellow Arkansans Ron Brewer and Marvin Delph, he formed the much hyped, even more idolized “Triplets,” who in 1978 led their team to the national tournament “Elite 8” and, 12 months later, to its “Final 4” and an impressive 32 and 4 season record. During his four Fayetteville campaigns, he tallied 16.9 points per game, his scoring average soaring each season from 12.6 in his first to 22 in his last. The same seasons, too, saw his assists-per game improve from 2.1 to 2.7. During the quartet, he also snared a school record 588 rebounds while averaging 8.3 per game, uncanny marks for a performer just 6-foot-3. Nor was Sidney a liability on defense. As one observer notes, “His defensive play for Coach Sutton won accolades nationwide.” Thus, as Sidney enjoyed All-American honors and advanced to completing the B.S. in the spring of 1979, the Milwaukee Bucks of the NBA surprised no one by selecting him first in the annual draft. By 1981-82, while not missing a contest, he averaged 19.8 points, a career-high 6.7 rebounds and 4.8 assists per game, marks earning him a spot on both the All-Star and the All-Defensive Teams as well as selection to the All-NBA Second Team. The four subsequent campaigns saw him continuing at his stellar best, averaging more than 20 points and, each year, tallying at least 330 rebounds and 300 assists. His defense remained spectacular, twice gaining him the Defensive Player of the Year Award. Simultaneously, Bucks’ Coach Don Nelson publicly voiced what many a player and fan had long sensed: Sidney possessed incomparable mental toughness. Nor did he fail, off the field as well as on, to garner increasing respect during the entirety of his statistically rich playing career, which included a spot on the coveted All-NBA First Team in 1982-83. That respect has accompanied the East Little Rock product into retirement. But it has not traveled alone, as Coach Elders clarified in an interview last November by contending that ‘’Sidney has enjoyed success at virtually everything he has put his hand to.” And he has “put his hand to” a host of ventures — some entrepreneurial, more community — since playing his last game in 1991. At age 61, Sidney enjoys “virtual godlike status…in Arkansas,” opines another observer. Pulaski County and the 501 are more than proud that his roots lie in their soil.